Hey CG Fans! We have some more exciting news for you in the contest and sweepstakes category from CustomizedGirl.com! 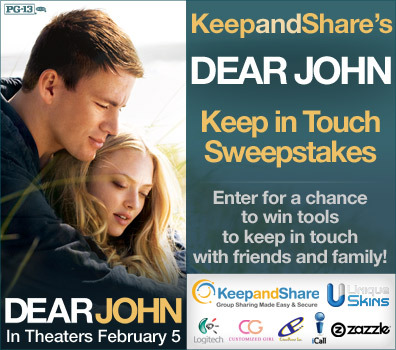 We are a co-sponsor of the Dear John Keep in Touch Sweepstakes. One of the main prizes you can enter to win is a $500 gift card to CustomizedGirl.com! It’s really easy and totally free!